What was your school lunch routine? I was picky and was not a giant fan of hot lunch very often, but I didn't eat much of what mom packed, either. Then I got to high school (hail, Derham Hall!) and we were that rare high school that while we had a kitchen, it went unused except for a rare nighttime event. Our lunchroom was stocked with vending machines. Totally unhealthy, and for us girls, totally awesome. Our boys' school across the field had a kitchen, and they envied us our machines. 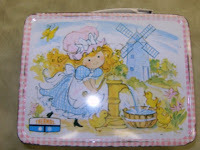 That photo, the Polly Pal lunchbox, is the one I had in grade school. A weird ripoff of Holly Hobbie, I think it was. Needless to say, I did not pick it out.